Unfortunately, the dress you are looking for (Style: DQ-8771, Name: Strapless Sweetheart Lace Dress with Ruched Waist) is no longer available. 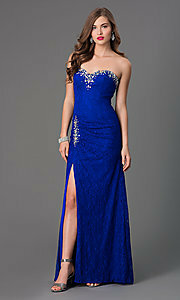 Glamorous and surprisingly affordable, this long lace prom dress will sparkle under the lights. For under $200, this beautiful sweetheart gown has details that make it look extravagant. Dazzling iridescent jewels trim the sweetheart neckline and skirt on this elegant gown. The structured sweetheart bodice flatters your figure with an alluring lace-up corset back to ensure a perfect fit to this beautiful evening gown. The figure-hugging full-length skirt skims your curves while stylish side ruching and a side slit create a beautiful silhouette to this lace dress. Included removable straps allow you to alter your look and a matching shawl creates a versatile ensemble you're sure to love. Lace, Ruched Waist, Jewel Detailing, Please Note: This dress comes with removable straps and matching shawl. The model is 5' 7.5" and wearing 2.5" heels.